In Mr Puzzle’s lair (repected professional on right, neophyte on left). Ed - Just look at that display! Soooooo jealous! I am once again very grateful to Mike Desilets (the Puzzlemad foreign correspondent) for providing me with this wonderful article and reminding me that I am very overdue making a purchase from MrPuzzle. I've had a very busy week and also had to work in the hospital emergency operating theatres all day yesterday. This meant that my usual gym visit HAD to be done today before my various chores. Mrs S has told me that if I get fat then I'm out and I daren't take that risk! After 22 years of marriage, I still have the same waist size as on our wedding day and cannot possibly risk a change. The supplied article from Mike has needed almost no editing and will give me a free afternoon to catch up with the gardening and avoid yet another Whack! Ouch! This week I have something quite special to report. While I’ve enjoyed doing puzzle review-type posts for Puzzlemad, I am VERY pleased to be able to report on something a tad more social this time. The online puzzle world is very stimulating in its' own way, but meeting and talking puzzles in person with a professional is really special and not something I am ever able to enjoy on this tiny rock of an island. Thanks to some extremely fortuitous work scheduling I was able to spend a little time in Queensland, Australia on my way back from a project a couple months ago. Why fortuitous, you ask? 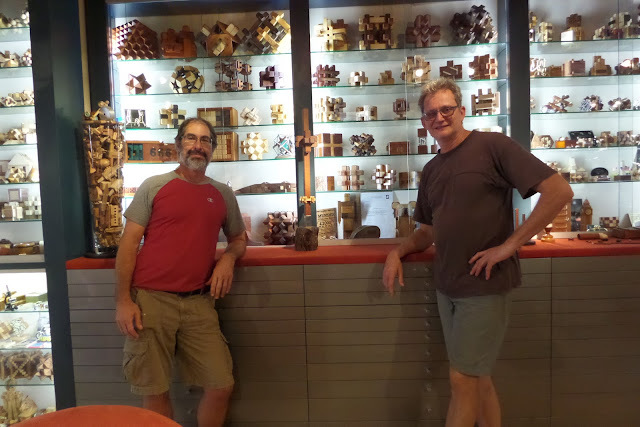 Well, besides getting to spend a day in the magnificent little city of Brisbane, it gave me the opportunity to drop in on one of the world’s premier puzzle designers and makers, Brian Young, and his lovely wife Sue, who together run MrPuzzle. Brian needs no introduction to most puzzlers, so I’ll assume you have at least a passing familiarity with his work. If you don’t, just study the MrPuzzle website and/or search any of the major blogs for reviews of his puzzles. I have always had my eye on Brian’s puzzles but for some reason never managed to pull the trigger on a purchase. Shipping cost was usually the deciding factor. It’s always a bummer when the shipping is half the price of the item. I begin to think about the extra puzzles I could get with that money if I ordered locally (i.e. not internationally) and within ten minutes I invariably dump my cart. But Brian’s design work and execution are so well regarded, and so novel, as to be practically irresistible (Ed - ain't that the truth - just look at my top shelves and my desk and my sideboard to see the fabulous beauties I couldn't resist). So when I discovered that I was passing through Queensland I made up a wish list and emailed Brian to ask if I could pick them up in person to avoid the shipping cost. Brian graciously acceded to this artful self-invitation and offered a workshop tour to boot. Well, I can tell you, for someone of my humble station in the puzzle community, this is the equivalent of a trip to Disney World. It was a fantastic opportunity and one that I tried my best not to squander. So this post is a report on the highlights of the visit including some cool puzzles from Brian’s collection, the sights and sounds of an industrious puzzle workshop, and whatever miscellaneous puzzle trivia I can remember from the trip. For those of you who visited Brian’s place during IPP 27, this will be a trip down memory lane. Let me start by saying that Brian and Sue live in a pretty remote place. Not by Australian standards, of course, but by any other standard they live in the boonies. It’s a great spot on a hillside with just enough acreage to buffer against nosy neighbors. It also makes for a tranquil working environment and I even hear from the Youngs that there are kangaroos lurking up in the hills. Australians don’t give a second thought to that, but to me kangaroos are like unicorns. I have yet to see one and I am not completely convinced that they really exist. Australia is full of such fantastic wildlife and it has provided inspiration for some of Brian’s most endearing puzzles. More on that later. World’s tallest and probably largest burr - fully functional. Brian on left. 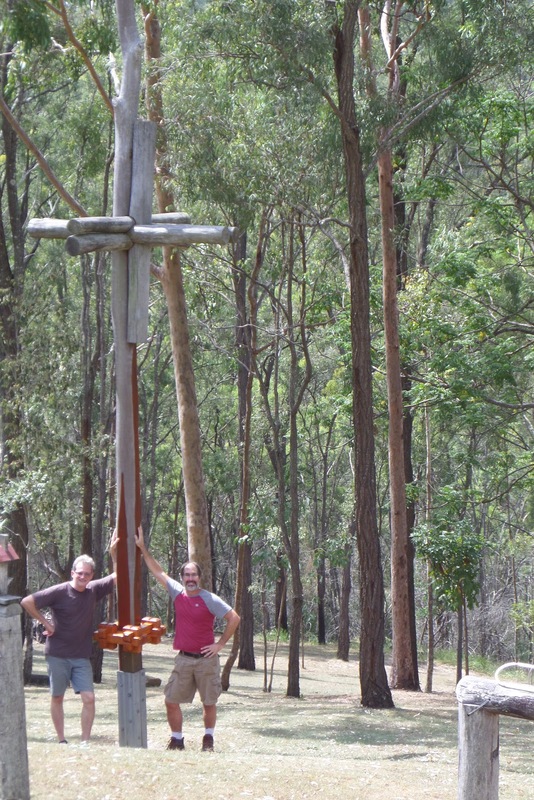 You’ll know you are at the MrPuzzle compound when you see the gigantic burr standing sentinel in his yard. It may or may not be the largest burr in existence, but I’m reasonably certain that it is the tallest burr in the world. This is a fitting welcome to Brian’s puzzle world and gives you some idea what you are in store for. Although Brian designs puzzles of all sizes, he is somewhat unique in his production of some truly large puzzles, mega-puzzles if you will. The monumental burr is but one example. Another is a very large stainless steel “Chinese rings” puzzle dangling nonchalantly on a nearby fence post. Giant rings - definitely a two person puzzle. There’s no scale in that photo, but let me tell you, these rings would be a challenge to manipulate alone. With a little teamwork, however, and a case of Castlemaine, it could be a real blast. But this isn’t all. At the door to Brian’s puzzle cave stands an actual 1950s-era Queensland telephone booth, refurbished and converted into a mammoth packing puzzle. Again, bring a friend! 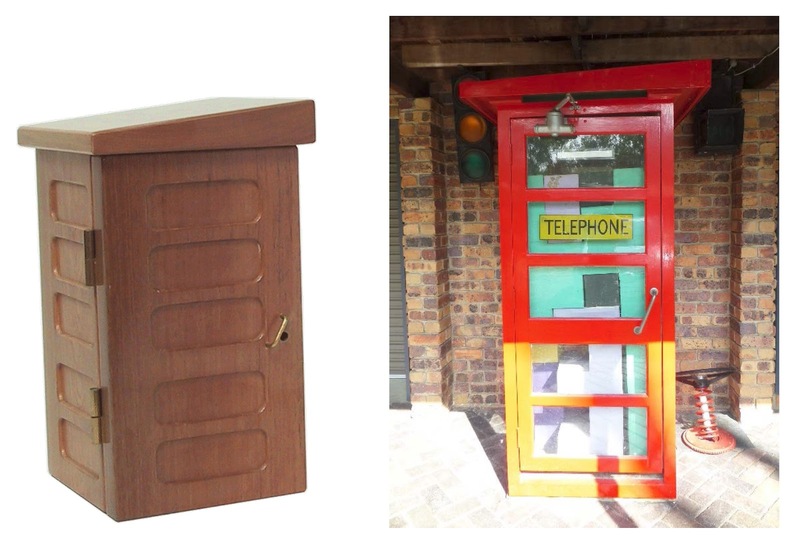 This life-size puzzle was the model and inspiration for Brian’s classic Telephone Box, a combo sequential discovery/packing puzzle. Wendy standing watch over the puzzle room. Part of the Young Collection. Lots and lots of great puzzles. If you’ve ever had the pleasure of touring a real puzzle collection (which I hadn’t until now) you’ll know that it is a bit overwhelming. The sheer variety, in any one class, is a lot to take in. 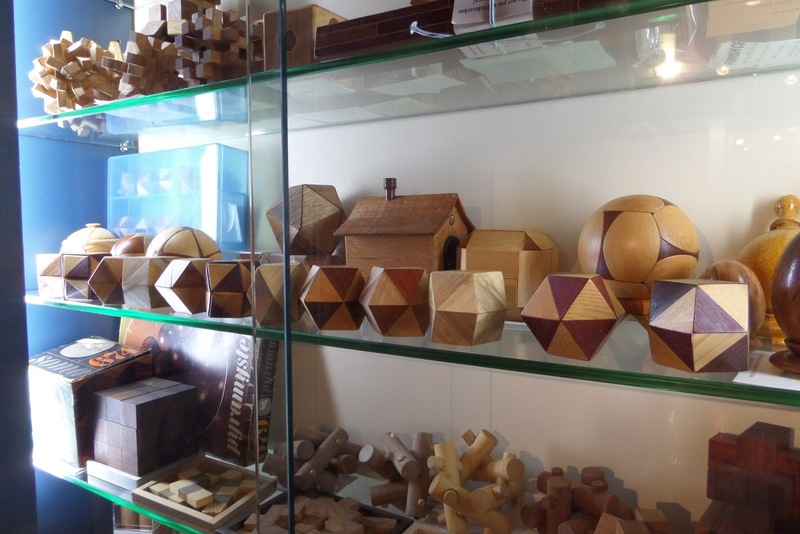 Brian has quite a number of beautifully made wooden burrs, polyhedra, and take-aparts of various descriptions. 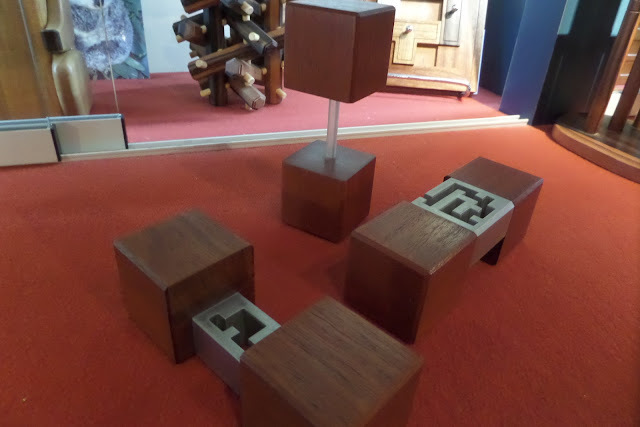 As a woodworker himself, it is no surprise that these are the centerpiece of the collection. They look very handsome in a back-lit case, as you can see. Brian thought that my publisher and editor, Kevin Sadler, would find his set of pennyhedrons especially attractive and mouthwatering, and I agree. Many pennyhedrons - they all look the same until you try to open them. Thou shalt not covet thy neighbour’s puzzles. Those pennyhedrons are awesome, but my personal favorites are some of the older sequential discovery/burr hybrid designs like the adorable Wombat. Brian walked me through the solve on this one and it is a very cool puzzle I must say. Too bad that very few people will ever get to enjoy it (Ed - I was lucky enough to solve big Steve's copy at an MPP a couple of years ago - it is breathtakingly wonderful!). I’ve never seen one come up on the secondary market, which is the norm for MrPuzzle designs. It is extremely rare for any of the limited edition pieces to become available. That alone is a testament to the quality of these puzzles. For the Wombat, you also get a biology lesson in the deal. If you solve the puzzle, you’ll discover that Wombats excrete square faeces. Yes, that’s right, little cubes. Brian has faithfully included this particularity in the puzzle. Helping the poor Wombat to relieve himself is, in fact, your end goal. It’s a fantastic piece of design, both aesthetically and puzzle-wise. 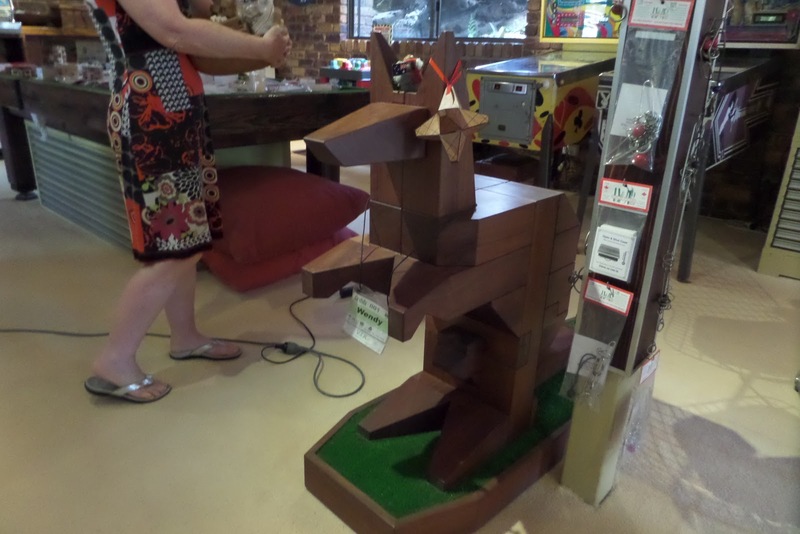 It’s also an example of Brian’s propensity to Australianize his puzzles. You’ll see it in many of the limited edition and IPP exchange puzzles he has produced. Took me months to solve it! Another great puzzle Brian walked me through the modern classic, Opening Bat. It wasn’t a spoiler for me since I can’t remember any of it and, in any case, will never in a million years own one. But it was a great honor to have the designer himself solve and explain the puzzle. And if you had any question about the complexity and ingenuity of the puzzle, know that Brian himself was momentarily stumped at a couple points. It is intricate and, well, puzzling. Like all of Brian’s exclusive puzzles, thematic elements are woven throughout and Australian history and culture take center stage. It’s clear that a lot of heart goes into these puzzles. Minotaur Burr, a highly successful Potts-Young collaboration. Scaled up, this would make nice furniture! Yet another puzzle which I was happy to finally see in person was Minotaur Burr, a very unique maze-interlocked burr designed by Frank Potts. Allard has a nice review of this puzzle with some characteristically excellent photographs. Frank’s vision was brought to life by Brian back in 2008. Construction of this puzzle involved meshing aluminum, wood (core and veneer), and a polycarbonate rod. Quite a difficult mixed-media undertaking for any craftsman to pull off and I doubt we will ever see it produced again. With its undeniably sculptural quality and Mid-Century Modern lines, I count it among the most attractive puzzles I have ever seen. But wooden beauties are not all you will find in the cases. Brian collects widely and has countless disentanglements, which he confesses are not his absolute favorite class to solve (Ed - Brian - you could send them all to me then!). I saw many items that I own among the entanglements, which was encouraging, and even more stuff that was completely new to me, which was also encouraging. 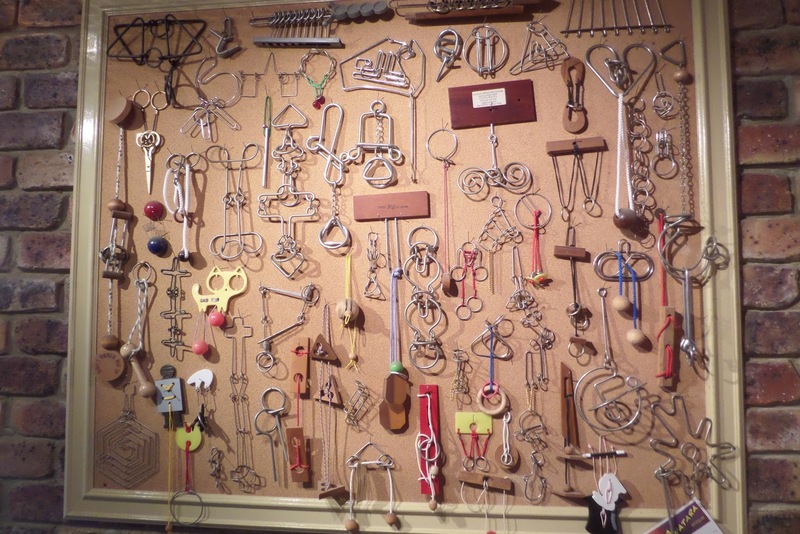 He has what appears to be a very extensive assemblage of Frank Gregory’s Livewire puzzles which, given Frank’s recent retirement, becomes increasingly important. 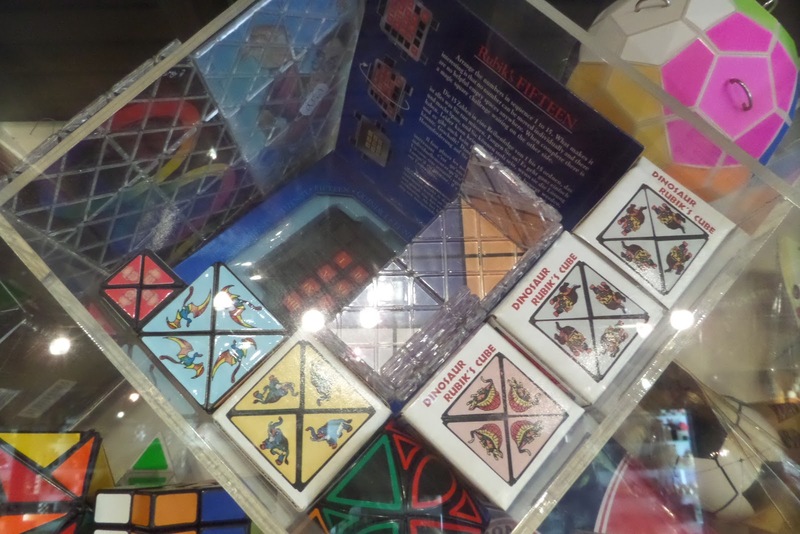 One of my many regrets is not having more Livewire puzzles (Ed - I have lots!). They’ve been a real institution among disentanglers for decades. Hopefully some enterprising young bender will fill the void and keep us supplied with quality wire. Like most of us, Brian does not generally strive for “completeness” in his collecting, but rather acquires things ad hoc as they grab his fancy and, of course, as they become available. 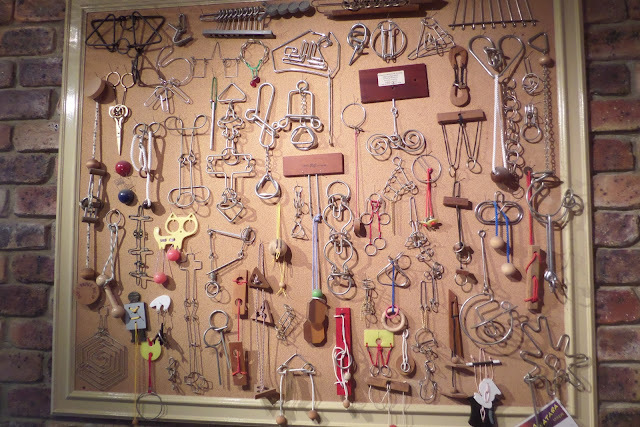 A puzzle collection is a highly person thing, reflecting the sensibility of the collector more than anything else. Judging from my brief observation of Brian’s collection, I would venture to suggest that puzzle designers have an especially curatorial approach to collecting. 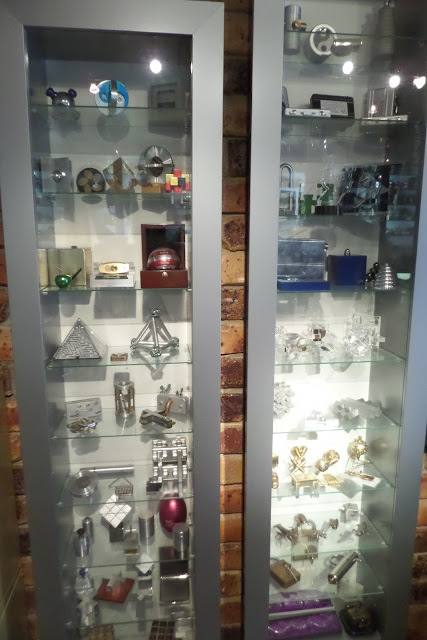 At least that’s my romantic vision of the designer-collector, populating his display case with ideas and concepts. The truth is probably more prosaic. 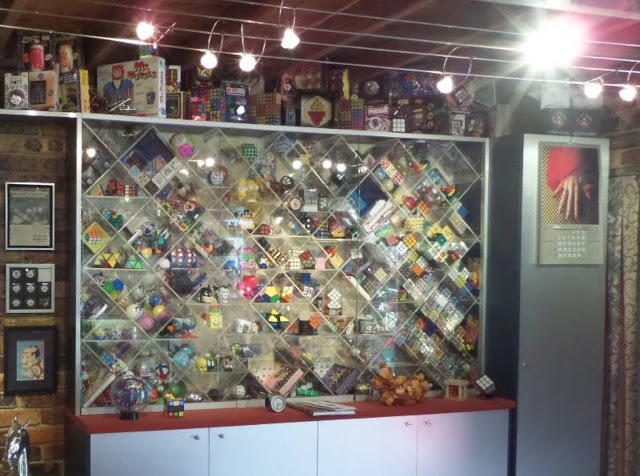 Twisties in a suitably "cubified" display case. Thousands of dollars’ worth of cube. 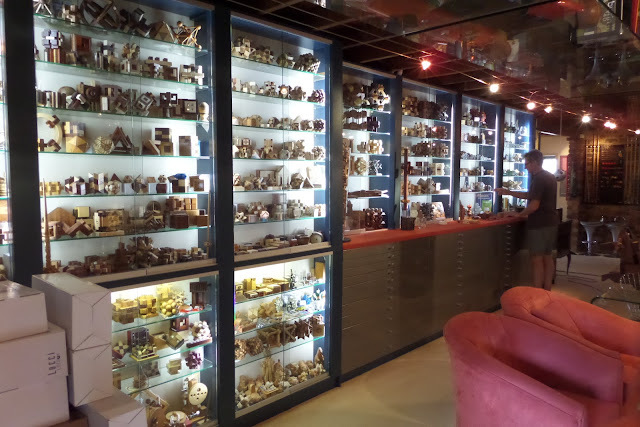 Across the room from the wood display is a small collection of twisties. I don’t know much about these so I won’t bother to embarrass myself trying to name them off. But Brian did point out one that had a good story. This is the much sought-after (by some) Dinosaur Rubik’s Cube aka Dino Cube, a corner turning hexahedron invented by Aleksandr Ordynets. It sports, you guessed it, colorful dinosaurs on the sides. Now, this story is not about design nuance or twisty mechanics, it’s about the shocking value that these puzzles command. Brian picked up his set of dinocubes very casually, not thinking much about it except that they were interesting and reasonably priced. He soon thereafter witnessed, to his amazement, a single dinocube sell for nearly a thousand dollars at auction. Apparently these fanciful little cubes are highly sought after. 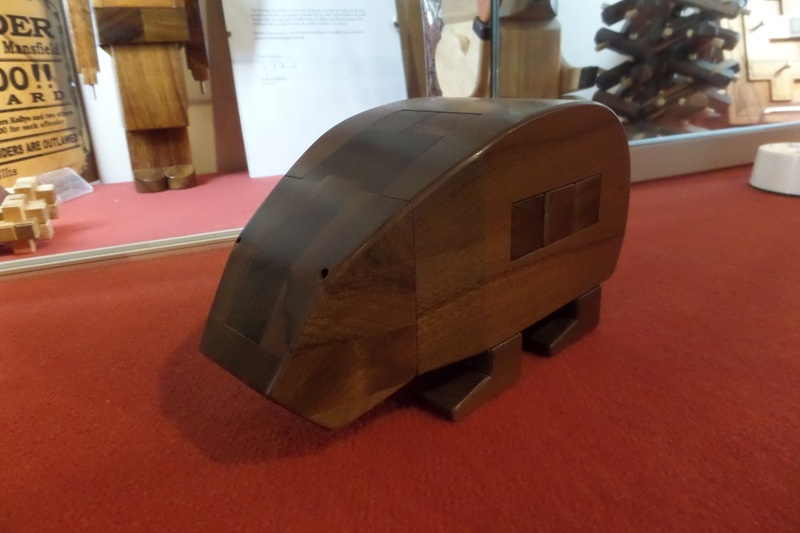 I can report with confidence that Australian master craftsman Brian Young did not pay a thousand dollars (apiece) for his plastic Dino cubes.... and apparently he is not anxious to cash out on them either. They are money in the bank, after all, and remain on his shelf as a testament to occasional dumb luck. Alright, that’s enough for this installment. We haven’t even gotten into the workshop yet, so stay tuned for more on tools, fancy wood, and assembly process. Over tea, Brian and Sue also gave me a primer on the business end of puzzle making, pricing, and marketing. I think you’ll find that aspect interesting and illuminating. It’s not exactly easy to make a living in the puzzle business but MrPuzzle has managed to stay in the game for nearly a quarter of a century. They must be doing something right. Without divulging any trade secrets, I’ll try to explain what in the next instalment. Ed - Wow! What a fantastic trip! What a fantastic experience! What a fantastic collection! What wonderful skills! I am very proud to count Brian and Sue as friends and I look forward to meeting them again when the IPP comes back around to Europe. In the meantime, I really must try and save some cash for a while and buy some more of Brian's stock! I agree Splinter! WOW!! I need a trip to Oz! Incredible! Hmm, definitely must try to make a trip to Brisbane...nice write up Mike!! You won't regret it if you do! Hard to do it justice really. Very cool! Can't wait for Part 2!